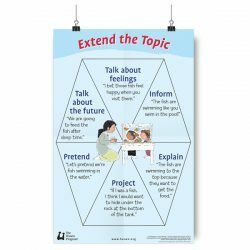 Learning Language and Loving It Poster – Extend the Topic – When you extend the topic, you provide additional information that increases a child’s understanding. 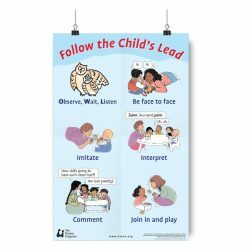 Learning Language and Loving It Poster – Follow the child’s lead – When you follow the child’s lead, you pick up on her interests and go with them. 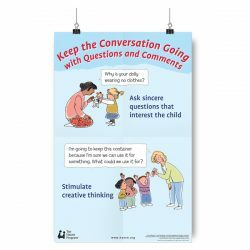 Learning Language and Loving It Poster – Keep the conversation going with questions & comments- Asking genuine questions that build on what the children have said and making comments that show your interested provide the kind of conversations that are the building blocks of children’s language development. 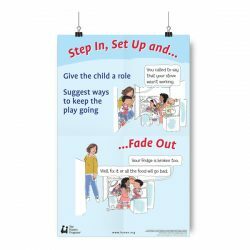 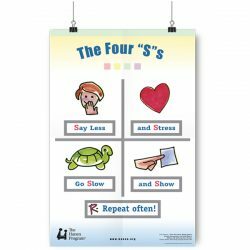 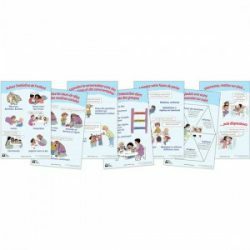 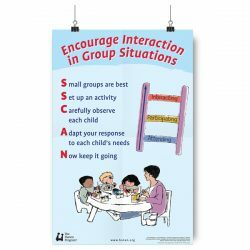 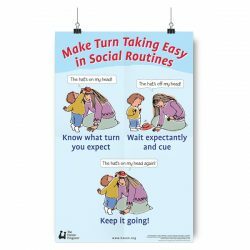 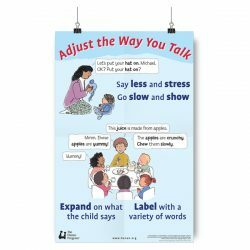 Learning Language and Loving It Poster – Make turn taking easy in social routines – Infants and children who are inexperienced turn-takers learn a great deal from familiar, repetitive, predictable interactions that contain clear cues as to when to take a turn. 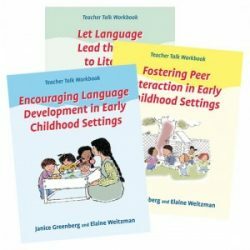 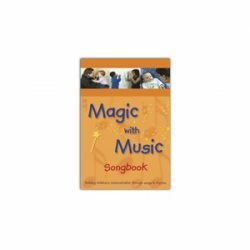 Teacher Talk Workbook Series of 3:This set of three illustrated workbooks gives early childhood educators and preschool teachers practical, real-life strategies to help children in their classrooms interact, communicate and develop their social, language and literacy skills. 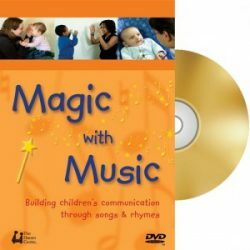 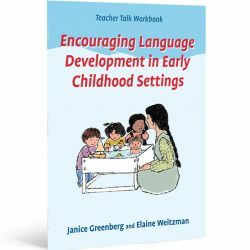 This booklet provides a step-by-step approach to promoting children’s language development in child care, preschool and other early childhood settings. 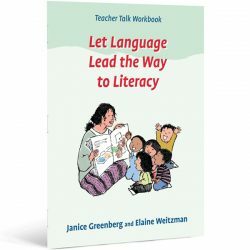 Teacher Talk Workbook Series – Let Language Lead the way to Literacy – This booklet will show you how to create an early childhood environment that helps lay the foundation of literacy. 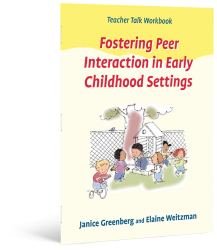 Teacher Talk Workbook Series – Fostering Peer Interaction in Early Childhood Settings – This booklet will show you how to create an early childhood environment that encourages children to interact with one another.